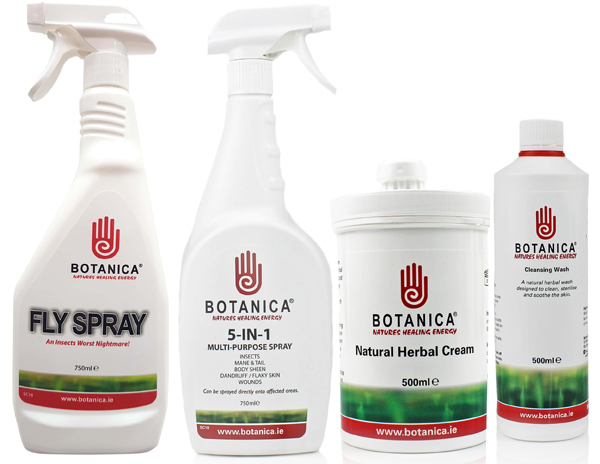 When preparing for competition, a helping hand that produces great results is what you need and that’s exactly what you get with the Botanica range of natural products. For perfect show condition you can rely on Botanica Cleansing Wash and Botanica 5-in-1 Multi-Purpose Spray to get great show sheen and a healthy coat, Botanica Herbal Cream to soothe sore skin and Botanica Fly Spray to help keep annoying insects at bay! Botanica Cleansing Wash – a natural herbal wash that is designed to clean, purify and soothe the skin on the most sensitive areas of your horse. An ideal pre-show wash for legs and heels, or other sensitive areas of your horse, Botanica Cleansing Wash helps to remove any dirt or scabbing which may be present. Botanica Natural Herbal Cream – a unique combination of herbal ingredients carefully selected and blended to feed and encourage healthy skin, Botanica’s Herbal Cream is a competition prep essential! Make sure that cuts, grazes, mud rash, cracked sore heels, girth galls or other skin issues don’t hamper your competition plans with this all-purpose natural herbal cream which helps support and maintain a healthy skin against excessive external and environmental conditions. Botanica 5-in-1 Multi-Purpose Spray will be your Best Friend for competition preparation, reducing grooming time by up to 85% and helping to keep your horse cleaner, for longer! Used by competitors at all levels, from grassroots to Olympians, this anti-static spray conditions, shines and detangles, giving that extra sheen and resulting in a smooth and sleek coat. A must-have for your grooming kit! Botanica’s Fly Spray is an all-natural spray with a unique formula that can be used on all animals to keep them protected for longer. This plant-based spray is sweat resistant, non-greasy and is free from toxins, chemicals, lanolins, parabens and prohibited substances. So don’t let annoying flies let your competition preparations go to waste – simply shake well and spray liberally as required, for effective, day-long protection from flies and biting insects. We value your privacy and never share any personal details with any third party. In the event you win any of our competitions the details you provide will be forwarded to the prize provider only.